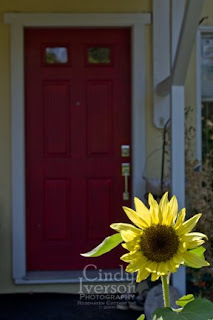 Today, just outside the little red door of Rosehaven Cottage blooms the first sunflower of this summer. 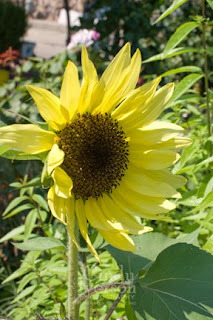 The pale lemon-yellow sunflower is a "volunteer" from last year's sunflowers. We keep our sunflowers up on their dried stalks long after they've wilted so the birds can use them as natural birdfeeders and pick every last seed out of them. But no matter how ravenous those birds are, there's always a few seeds that fall to the ground and reseed for the next year. This is the first of those to bloom in the Rosehaven Cottage gardens this year--yet another happy delight of summer. Dearest Cindy...forgive my tardy visit...but I come with a tiny gift for you, heart in hand. It is on my blog today if you would like to share a cup of blueberry tea with me...that would be wonderful. Such beauty I love them. 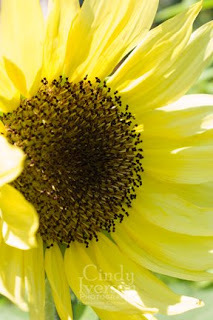 I love sunflowers in the garden. I like sunflowers; they seem like such happy flowers. I'm growing dwarf sunflowers this year. They're from seed I took from a shorter sunflower a couple of years ago. No tall ones this year, and I wish I'd have grown some. Next year!